While the water was heating, I then focused on preparing the steaks. Once seasoned (recipe below), the steaks are placed in a pouch that was included in the system.There are actually two pouch sizes (small and large). 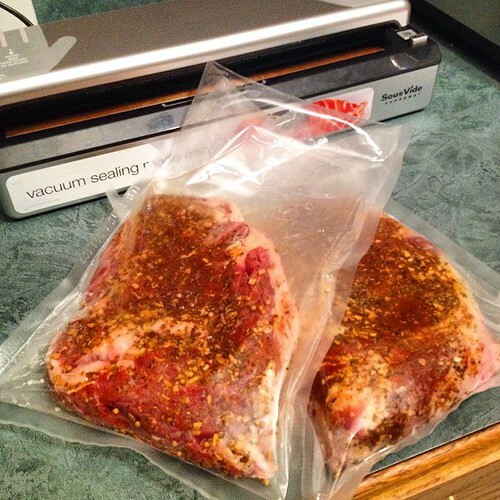 I placed each steak in it's own small pouch so I can vacuum seal it as much as I could. 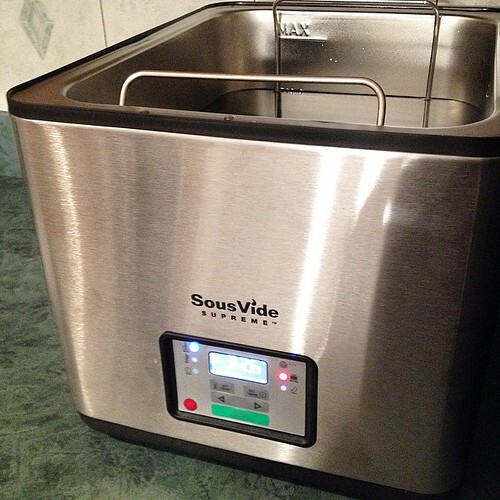 The SousVide Supreme system also included a vacuum sealer. Once the seasoned steaks were in the pouches, now the pouches must be vacuum sealed. 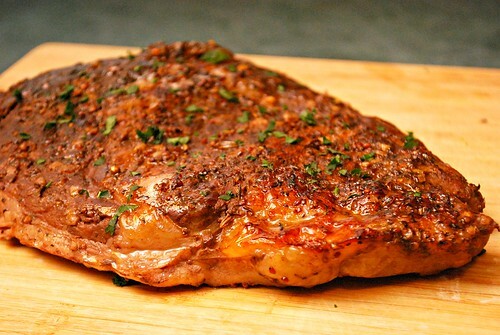 Doing so removes any excess air and concentrates the spices and seasonings into the steak. This also helps the steaks retain it's size (reduces shrinkage) and locks in moisture, nutrients and flavor. But most importantly, properly vacuum sealing foods for sous vide allows for efficient heat transfer for foods are cooked evenly and consistently through out. So once the steaks are vacuumed sealed, as shown above, they are ready to hit the sous vide pool. These steaks cooked at 56.5 C for about 2 hours for medium rare. Heat sous vide to 56.5 Celsius (or 134 degrees F). Combine the steak rub ingredients in a small bowl. Rub onto the steaks and place into the sous vide food pouches. Vacuum seal the pouches and once water has come to temperature in sous vide, place in pouches into the sous vide. Cover and allow to cook for 2 hours. Carefully remove from sous vide and from pouch. 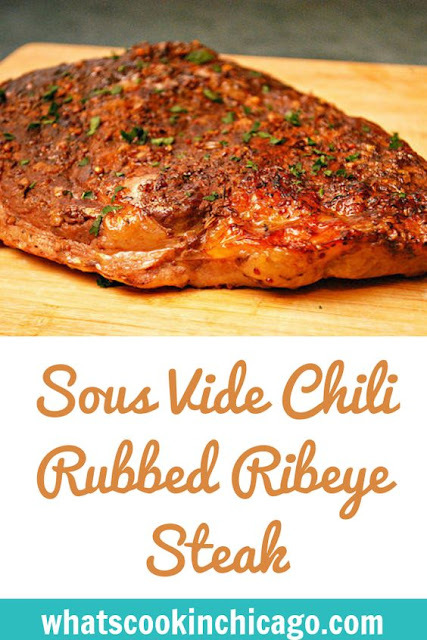 Transfer steaks to a broiler pan and broil for 2-3 minutes for a slight char and color. These look so good! Even at 9a!